The newly-designed Air Jordan 8.0 made a lot of noise after coming out last month in “carrier classic” edition and this month, Jordan Brand is expected to hit strides once again with a never-before-seen colourway of the silhouette. 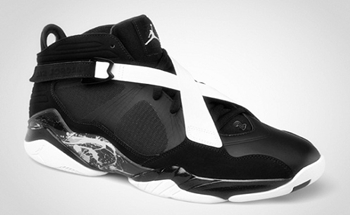 As part of the Jordan Brand Holiday Collection 2011, the Air Jordan 8.0 is now available in Black/Dark Charcoal – White colourway, which looks absolutely impressive. Made with black colored base with touches of white on the upper par, the shoe also features a combination of Flywire, suede, and mesh and it sits on a white outsole. Impressed? This one is available now so grab one now!